We embarked upon these rides when I learned that 24 people are blown up by landmines daily and half of them are children and we want to assist in MAG’s aim to try to make the world landmine free by 2025, as this is cruel and capricious and blameless children deserve better to be able to walk without fear. 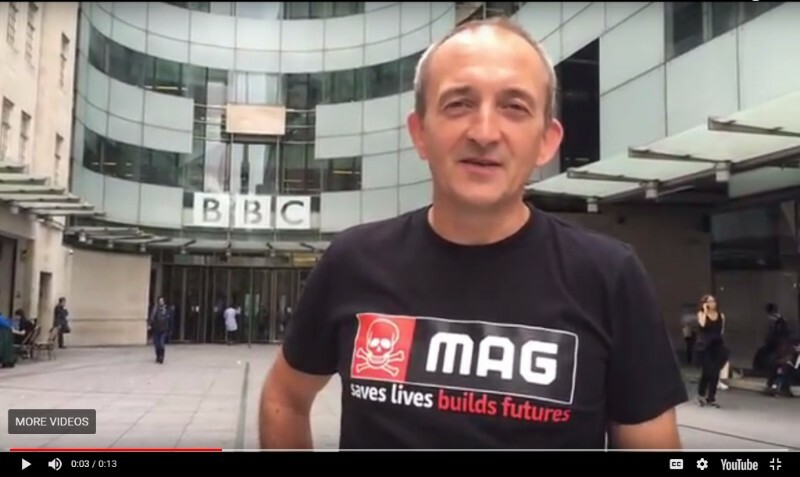 The great news is that MAG clear landmines and make peoples' lives better. They have helped 1.4m people to avoid being blown up by landmines, cleared 100,000 pieces of ordinance in the last year and as a result, the toll on innocent human beings being blown up has reduced from 24 to 20 over the past year. It still means that around 10 children are blown up daily, so our quest is still important. We will ride from London to Bristol on 20-21 July 2019 and London to Amsterdam on 10-12 September 2019. FEELING INSPIRED AND WANT TO TAKE PART IN 2019 - Learn more and volunteer Now! Some years ago I read a book called “One Step Beyond” by Chris Moon and it really changed my life. It was about a marathon runner called Chris Moon who had an interesting life before being blown up by a land mine and losing an arm and a leg. After he recovered, he continued to run marathons including the fabled “Marathon des Sables” which crosses the Saraha Desert and is accurately described as the toughest footrace on earth. I was really inspired by his story and grit and also by the horror and inequity of the tragedy that landmines have on so many children who are entirely innocent of the conflicts which they are involved in, that I decided to collect for a mine clearing organisation called MAG. They work tirelessly all around the world to help the 60 million or so people in conflict zones living in fear of landmines with the solid intention of making the world landmine free by 2020. Thank you for reading my story, now please help these victims, whose lives were irrevocably changed in an instant. Every £1 will make a difference. Although I have included my story here, nothing explains the reasons for this more than hearing an account from a journalist. Click on the link below to listen to a journalist’s account of the landmines that he saw first-hand in Mosul. It is very powerful and was broadcast on Radio 4 in September.